Tired of the “same old, same old” when it comes to hair adornments? If plain elastics, tortoiseshell hair combs and bobby pins are inducing yawns, perk things up a bit by making a one-of-a-kind hair ornament. Copper wire takes the lead for this project and the organic shapes that form its components are fun to make and convey an organic, Celtic vibe. The crafter can choose whether to place the pieces on the clip in a more expected, symmetrical pattern or aim for a less structured, free-form placement arrangement. Apply this concept to clips of all sizes and widths. Not only can a crafter make a small set of clips to hold the sides of the hair back, but a large one will accommodate a ponytail. The copper wire will accent any hair color beautifully, from platinum blonde to raven dark, and every shade in between. 1. Cut about about 12 inches of thick copper wire from a roll with the wire cutters. 2. 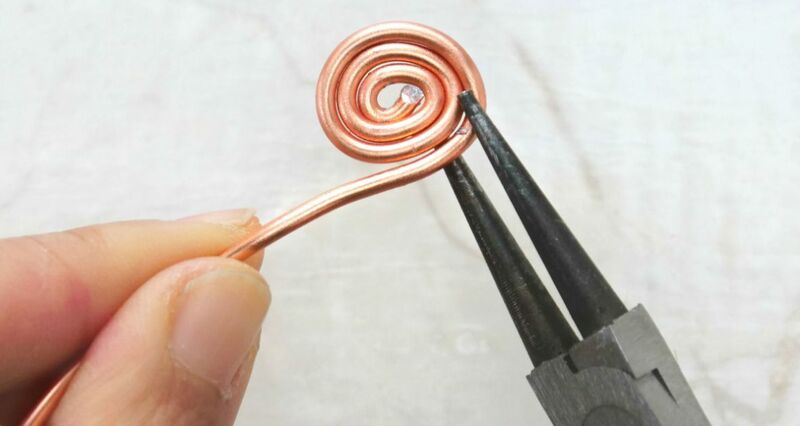 Start wrapping the wire around the curved end with the pliers, so that the piece forms a spiral circular shape. Keep wrapping the wire around the circle’s perimeter until it is all used. There should be about eight or nine concentric circles of wire that form the spiral shape. 3. Repeat steps 1-2 five times, except cut slightly different lengths of wire so there are three circle sizes: one large wire circle, two medium ones and three small ones. 4. Hot glue the largest wire circle piece to the center of the flat upper portion of the hair clip. 5. Glue a medium wire circle piece on either side of the larger one. 6. Center three small wire circle pieces on top of the lower row and glue in place. 7. Allow the glue to dry. 8. 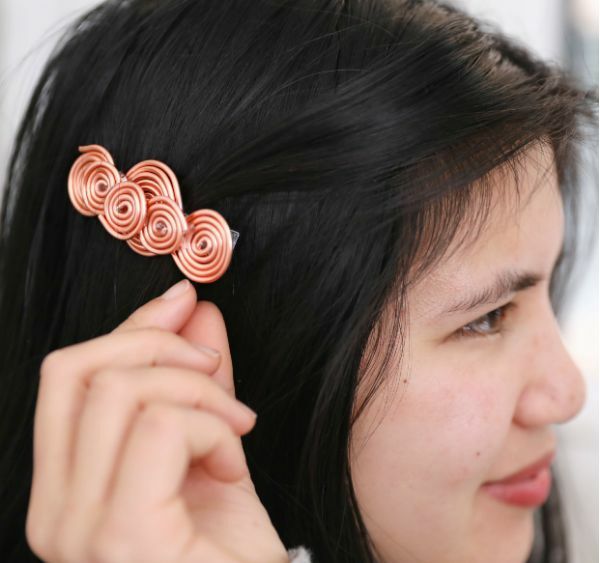 The copper wire hair clip is now ready to wear.